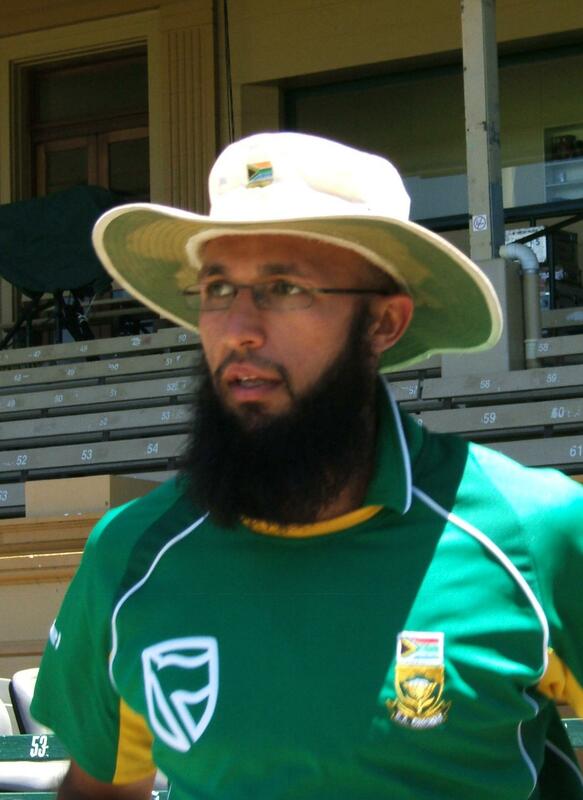 Hashim Amla has arrived. His back-lift to gully now appears the sort of lazy flourish that bored twelve-year-olds develop because they are staggeringly superior to their opposition, rather than the defect that presumed he wouldn’t cut it at international level early on in his career. That twirl of a back-lift is now brought down to defend, flick, drive and reduce Test bowlers into looking like schoolboys. He is silky and elegant in a manner that compelled Richie Benaud, the former Australian captain – and one of the most knowledgeable, and least myopic, of that country’s commentators – to describe him as “an artist in a team of artisans” during a solid first tour Down Under in 2008. At the time of writing (after the Wanderers Test match against Pakistan in early February) he was the International Cricket Council’s world number one ranked Test batsman. En-route to overtaking Australian captain Michael Clarke to assume that apex he had struck an unbeaten 311 against England at The Oval – becoming the first South African to score a triple-ton and the 22nd person in the history of Test cricket to do so. His batting is eye-catching. 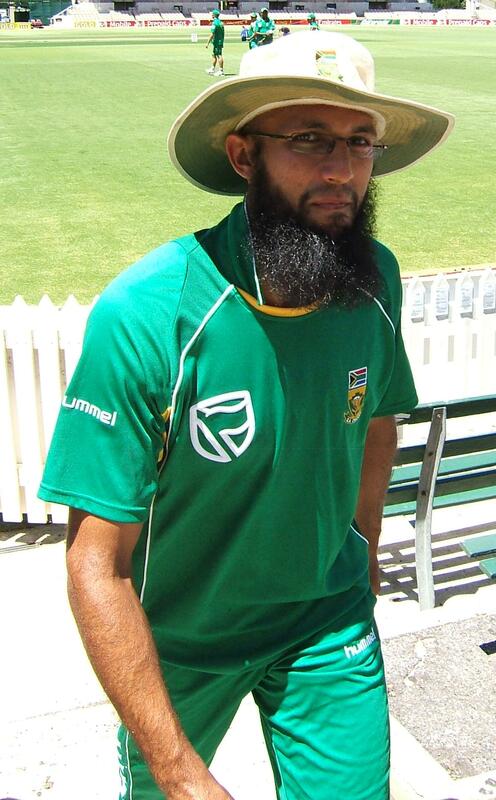 As is the shaggy square beard that marks him out as a devout Muslim in a team that has traditionally traded on what Jesus would do, Castle lager, jock-of-the-establishment-school-tie posturing and a gritty approach to the game that melded the conservative, dour and tragic elements that reside inside the Afrikaner and the Rooi-neck. If Jacques Kallis, the darling of the South African (white) cricketing media corps, represents the establishment with his hair implants, demeanor as wooden as his “big bat” and tweets calling for the return of the death penalty then Amla, all leg-side flicks as luxurious as his beard, imperious punches off the back-foot and mere physical manifestation represents its anathema – almost. In the chaotic, overlapping and contradictory world of South African identity politics even that would be too reductionist. Too simple. For, paradoxically, Amla remains from the establishment. In 1996, once the colour bar had fallen with apartheid, he moved as a 13 year-old to Durban High School, one of South Africa’s premier cricketing establishments (and progenitor of Barry Richards, another darling of the white cricketing establishment and one of Amla’s most vociferous critics when he first broke into the national team). His brother, Ahmed Amla, older by four years and a provincial batsman in his own right noted what this meant in a 2009 interview with CricInfo: “When I went to school, I only played with the Indian kids,” said Ahmed, who attended the all-Indian former House of Delegates Tongaat Secondary. “You had separate exams, the whites had separate exams. The integration hadn’t occurred yet. But when Hash came along, the system had changed so rapidly. That really helped him. He studied in an integrated school, played with and against white and other coloured kids. It does have a huge impact on the personality.” At junior level, he scored as freely as Herscelle Gibbs at a matric dance, playing in integrated teams that included current national teammates AB de Villiers and JP Duminy and captained the South African under-19 side to the World Cup final in 2002. Amla, a second generation “Indian” and the son of doctors based in Tongaat on the KwaZulu-Natal North Coast is, to a large extent, the personification of the success of the middle-class experiment in South Africa. He has come into the South African side on the back of enormous talent, but also comfortable privilege. That career escalation should be – and is to a limited extent – celebrated. Yet, it would be spurious to suggest that he represents the questionably constructed notion of a homogenous “Indian community” or previously disadvantaged blacks any more than he represents an elite cricketing system that until the fall of apartheid was built around ensuring white supremacy. Structurally, South African cricket post-apartheid was not based on the egalitarian principles of radical sports bodies like the South African Council on Sport (Sacos) who refused unification because there could be “no normal sport in an abnormal society”. Rather, following other black cricketers like Makhaya Ntini (who was spotted in the backwaters of Mdingi and spirited off to Dale College in King Williams Town) and Gibbs who attended Bishops in Cape Town, Amla’s journey was from within the establishment – his career is as much a case for the status quo as it is against the deficiencies of Cricket South Africa’s grassroots development programmes. That is not to say he did not – and still does not – battle prejudice. After scratching around for runs following his Test debut away to India in 2004, Amla was dumped after six matches despite having a better average than Kallis at that stage of his career with the media and former (white) players dismissing him as a mere “quota player” – someone included in the team because of melanin, rather than ability. The deepest of wounds in a game that, in South Africa, is infected (overtly and subliminally) by racism and paranoia about development in black communities and the slipping of standards (code for “the darkies are just not good enough”). Having quietly rehabilitated his technique, he returned over a year later scoring 144 against New Zealand at Newlands in Cape Town. He has barely looked back since. Despite the idiocy of the fake beards worn by fans demonstrating a George W Bush like cultural sensitivity, the 29 year-old is very popular among punters – and not for any novelty value but, rather, for his serenity at the crease and an ever burgeoning batting average. On Day One of the Wanderers Test match against Pakistan in February, he received the loudest cheer of any home batsman. But, for all the ease with which Amla connects with his teammates – many of whom he has known since schoolboy cricket – and despite an elegant and exhilarating batting technique that is amassing runs, the South Africa media retains a blind spot for Amla. This resurrects the age-old question raised by Trinidadian Marxist theorist CLR James in his seminal book on cricket, Beyond a Boundary: “What do they know of cricket who only cricket know?” James acknowledges, “to answer involves ideas as well as facts”. The facts speak for themselves. Within an increasingly hefty case-file for Amla, is that in becoming the fastest batsman to reach 3000 runs in one-day internationals, he required 12 innings less (57) than one of the most destructive batsmen in cricket’s history, the West Indian Viv Richards, a regal, brutal flayer of bowlers and misconceptions of white supremacy in the 70s and 80s. As does a Test batting average of 51.94 after 61 matches – bettered only by Jacques Kallis (56.48) – in a run-laden South African upper order. He is possessed of a quiet cricketing resilience and laidback approach to the bigotry of others – characteristics which Amla, perhaps self-deprecatingly, attributes to his Islamic faith – that has seen him endure the insult of being called “a terrorist” by former Australian cricketer, Dean Jones, live on air. Colombo 2006 and Amla, reinstated to the Test squad and fielding at backward point, held on to a catch off Shaun Pollock’s bowling to send Sri Lankan danger-man, Kumar Sangakkara back to the pavilion. Jones, unaware that his microphone was live said: “The terrorist has got another wicket.” Amla, who told the Guardian in 2008, that the comments “did hurt” added that it was, however, “a lesson to everybody who has hidden stereotypes. I remember Dean said to me, when he apologized, ‘Sorry, mate, I didn’t mean for it to come out on air’… Nevertheless, the teaching of Islam is that if anyone tries to apologise, you forgive them. We all have some inward prejudices that we need to address, whether it be of colour, race or religion.” These prejudices make it even more difficult for the South African media to allow itself an opportunity to reflect on, potentially, the best batsman this country has produced. An example, by the late British-born Peter Roebuck, perhaps one of the cleverer cricket writers working in South Africa, who wrote for CricInfo, without any sense of irony: “Of all his achievements, Amla’s emergence as the first member of the large Indian community to play Test cricket for South Africa has been the most significant. During the apartheid years the Indians tended to lie low. Shy by nature, resourceful by disposition, aware of their origins as indentured labour, they were caught in a racial no-man’s land, and so concentrated on making money and gaining a good education. To them cricket was an enthusiasm, almost an indulgence. Certainly, it could not be a profession.” A second generation “Indian” whose grandparents arrived in South Africa – not as slaves – from Gujerat, Amla has the wristy stroke-play that the cricket establishment stereotypically identifies with players from the Indian sub-continent. Yet, he dismissed the attempts at narrow cultural-racial mythologizing before his debut against India at Eden Gardens in 2004 by stating “my blood is green”. In The Black Jacobins, James examines the Haitian revolution of 1791, its leader Toussaint L’Ouverture and all the contradictions, ambiguities, flaws and paradoxes of liberation struggles. It would not be hyperbole to suggest that Amla’s appearances on the cricket pitch and its meaning, reflects similarly on South Africa’s own, ongoing, liberation struggle. This piece also appears in Chronic, the quarterly Pan-African gazette published by Chimurenga now out.